I’ve been to Grand Cayman before. It was 16 years ago…I was single and found myself “stuck” on the island for an extra 4 days at the end of my vacation because of 9-11. (I was due to fly home on September 12, 2001.) The airport security systems we don’t even think twice about today didn’t exist back then, and I remember getting to the airport at 6AM to stand in a security line for a 1PM flight. Every piece of luggage was hand-searched…twice. It seemed like forever. What I remember from that trip was how empty and primitive the island was…and how ancient the airport was, even for the Caribbean. Sixteen years later, the island has changed drastically: massive construction everywhere you look…huge investment properties are built, then stand empty, waiting for buyers. One “for sale” sign after another along the roads that line the island’s waterfront properties. A giant, soulless shopping center called Camana Bay is a stone’s throw from a very crowded 7-Mile Beach. And the airport? It now gets my award for one of the worst airports in the Caribbean: low-tech, crowded, disorganized, dirty. What made–and still makes–the Caymans shine are the beaches and the people. Despite the oversized resorts lined up on 7-Mile Beach, the sand and water are pristine. It’s still a scuba diver’s and snorkelers’ paradise. And the people, if you go out of the crowded tourist areas to find them, are as friendly and helpful as ever. They just seem a bit lost in their own home. The waters of 7-Mile Beach are still beautiful. 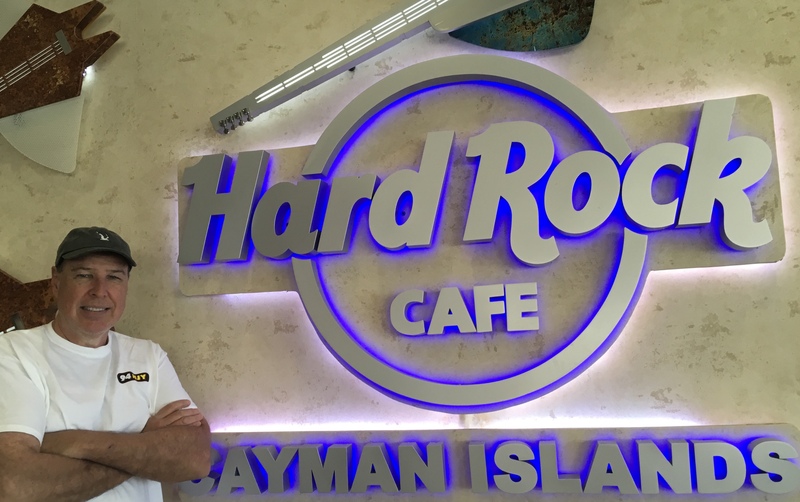 The Caymans were hit by a hurricane in 2004, and a billionaire investor by the name of Dart decided this was his opportunity to make the investment of a lifetime. The people of the Cayman Islands no doubt looked at him as somewhat of a savior–at least in the beginning. Here was a guy that was willing to invest a lot of money in rebuilding their beautiful island. 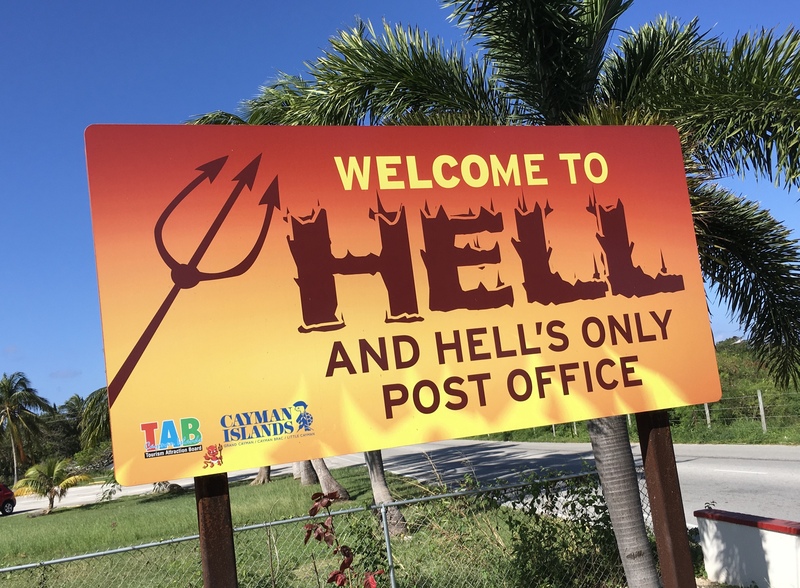 And though he did invest a lot of money in real estate–it’s estimated that he now owns 25% of all the real estate on Grand Cayman–sadly that money went into condos, shopping malls, and hotels. 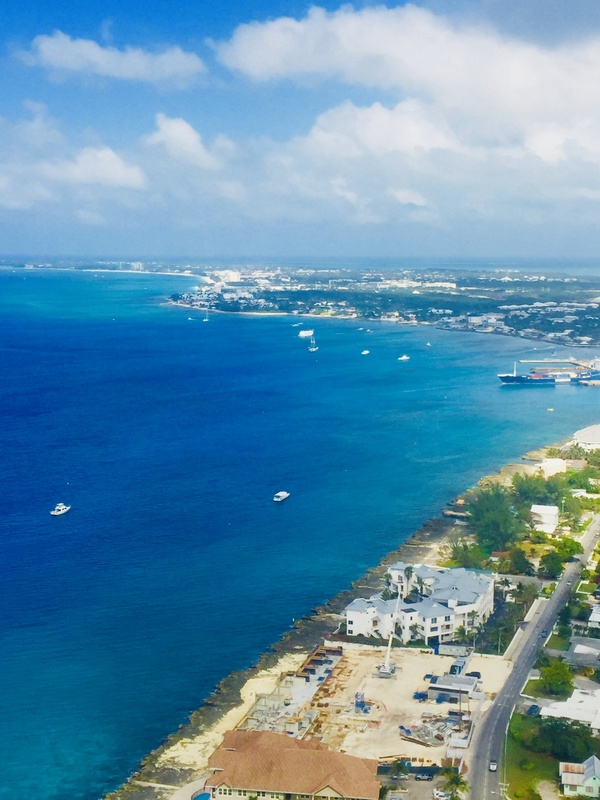 Little by little, the real heartbeat of the Cayman Islands was being replaced by large, sweeping generic slabs of concrete and glass reaching for the sky, and huge roadways connecting them to each other. Georgetown, the capital and where the airport is located, is crowded, dirty and hosts several cruise ships every day, dumping thousands of passengers for a few hours to buy the typical souvenirs and duty-free goods every cruise ship port holds. 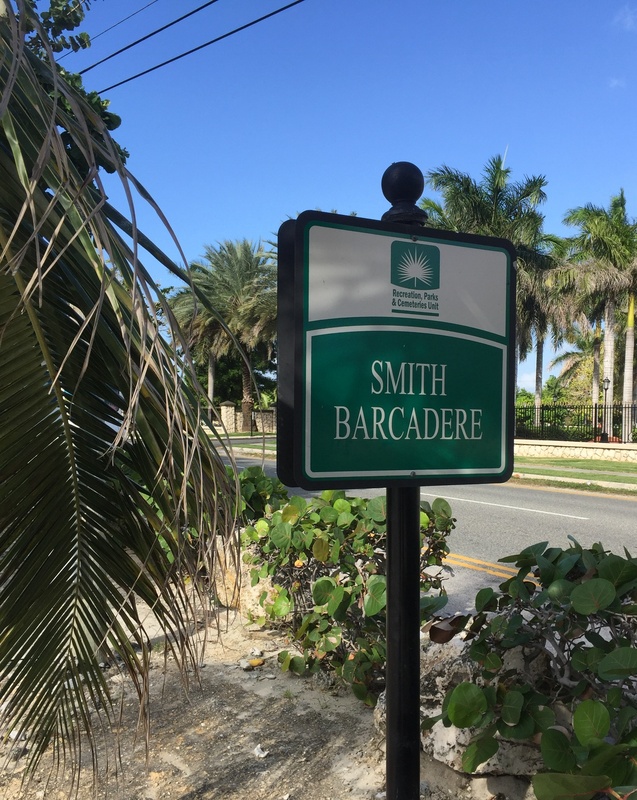 We chose to stay off the beaten path for our first couple of nights, finding a cute waterfront condo on AirBnB in Boddentown, the original capital of the Caymans, and much quieter than 7-Mile Beach or Georgetown to the west. The condo was clean, but the beach in front of it was full of weeds. Winds and currents were strong. We realized that it was a good home base to settle in at the end of the day, but that’s about it. We would spend our first couple of days exploring the rest of the island, from Boddentown to the East End to the North Side to Rum Point. 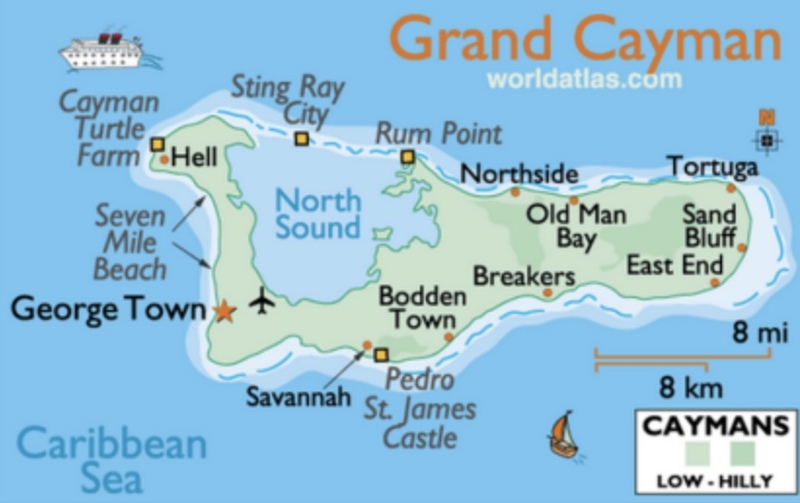 A simple map of Grand Cayman. There’s nothing better than finding a great little food place just steps from your condo, and the Czech Inn Grill hit the spot. They don’t sell alcohol, so it’s another few steps to a liquor store to pick up a few bottles before we finally sat down at the bar. Celebrating its first year the very weekend we arrived, we met the owner, George, and sampled several dishes from his extensive menu which did feature a half-dozen hearty Czech dishes. We passed on those and enjoyed more local fare: a delicious freshly caught wahoo ceviche, smoked ribs, and a huge cheeseburger for my daughter. It was a very welcome meal, along with my Mount Gay Rum that I purchased a few doors down, after a long day of flying and settling in. 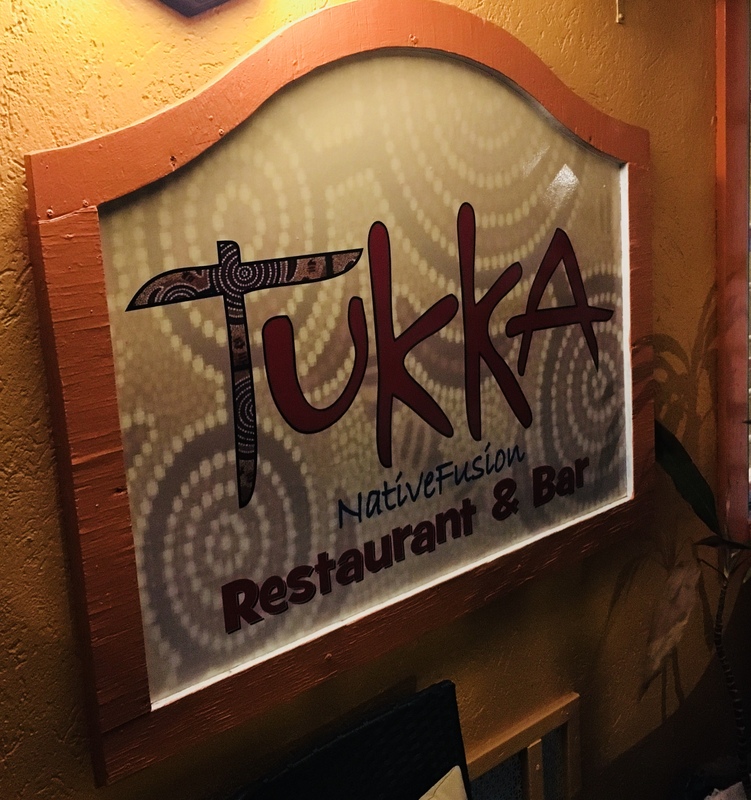 That evening, we headed for Tukka, a restaurant on the East End that got good reviews. It was already dark, so we saw no scenery, but we knew we’d be back this way the next day anyway. Among other things, Tukka boasted they had the largest rum selection on the island. 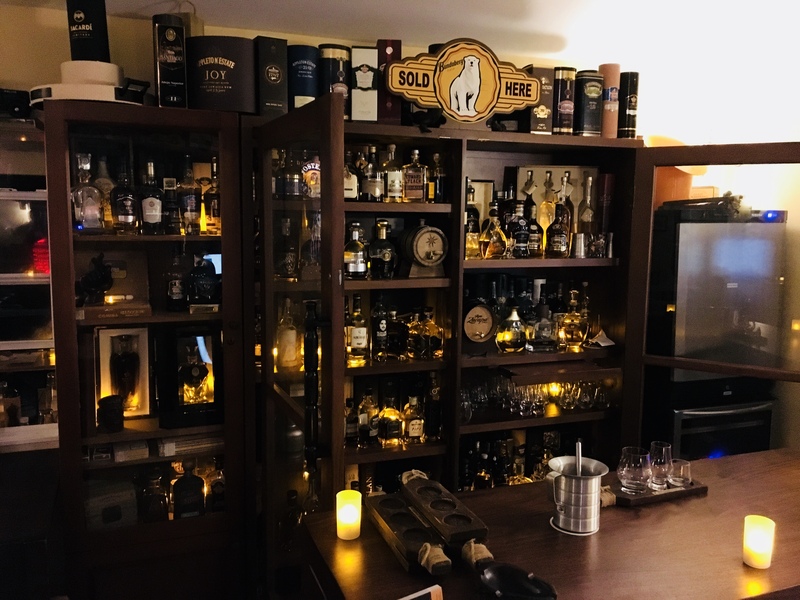 The rum bar at Tukka. What we found when we got there were a couple of truths that guided us throughout the rest of our trip. First, though Tukka’s rum selection was excellent, many places layed claim to the biggest rum bar on the island. And second: the majority of menus at the so-called better restaurants on Grand Cayman are very similar. Only a handful of dishes really separated them. Part of the reason for that is that everything comes from off-island, and everyone uses the same companies to deliver their ingredients. As for Tukka, we all thought the dinner was good, not great. The only exception was my lion fish tacos, which were a highlight. Lion fish is a nasty little invasive bugger, and requires hand protection when touching them, making them difficult to harvest and clean. But their meat is absolutely delicious, and I was very glad I tried it. Leaving Boddentown the next day, we headed east again, and started exploring the coast. 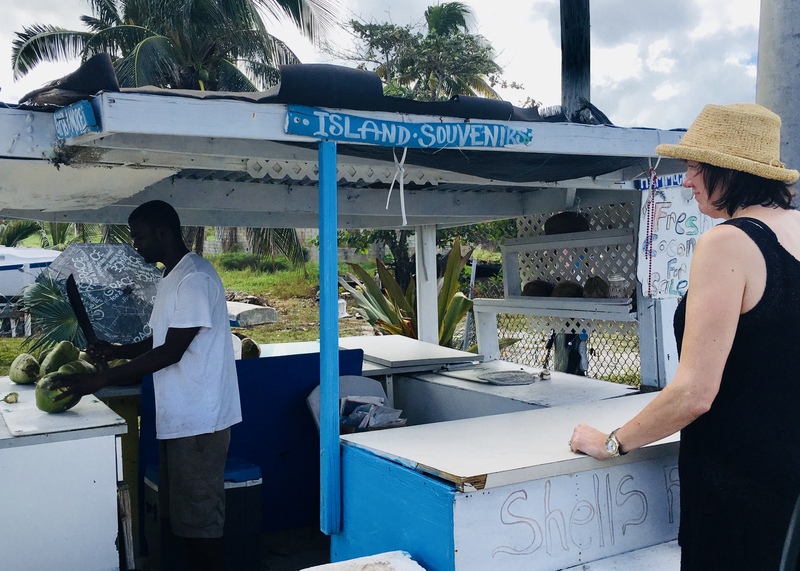 The south coast was too rough for swimming, but we enjoyed stopping at local fish shacks like Captain Herman’s for a quick snack of fried snapper with freshly made juices of cucumber, and carrot. I say “quick,” but I mean island-time quick. We were the only customers there, with 3 women serving, and it took an hour. Still, it was a beautiful day and they were fun to talk to. 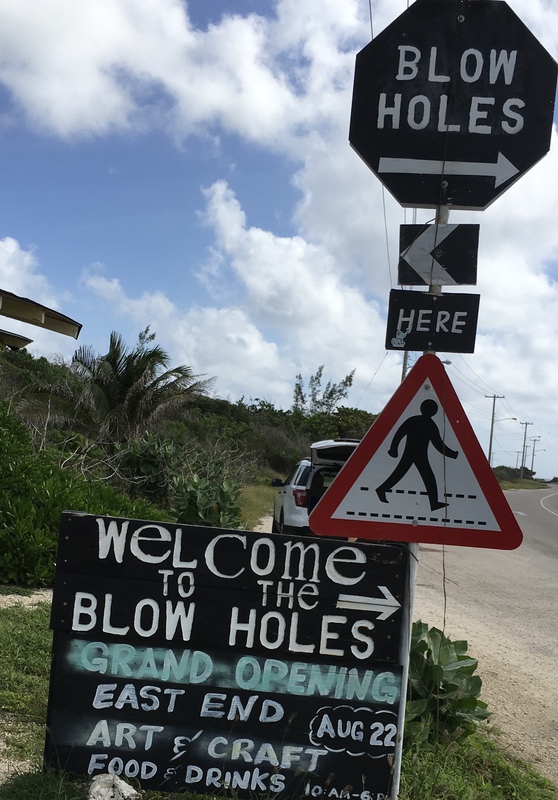 Our next stop: the Blowholes. Fun to watch these ocean-carved tubes pressurize and blast water high in the air. 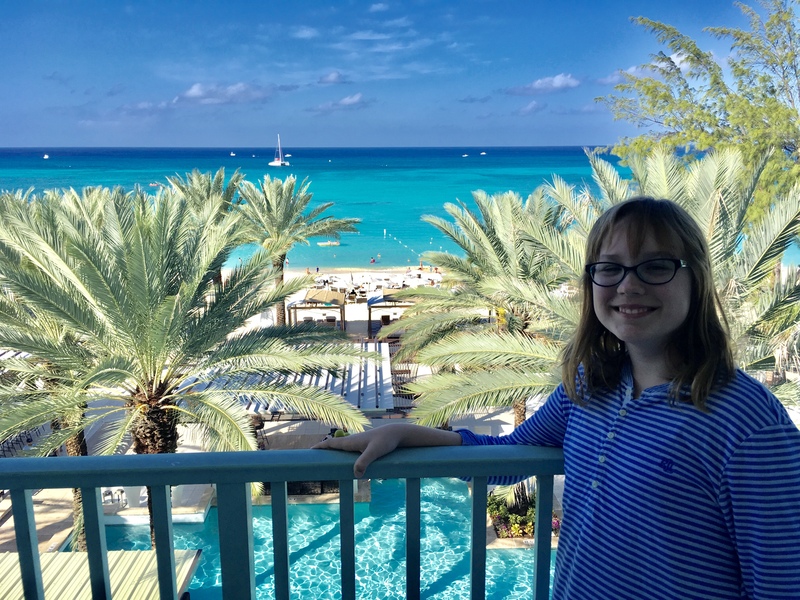 We searched for more local eats, wanting to stop at the “famous” Vivine’s, but my daughter craved a ham and cheese from Subway instead, and there was one located on the property of the Windham Reef Resort on the East End. (There are Subways and Burger Kings all over the island.) There was also an out-of-service ATM across the street, surrounded by a strip mall of closed stores. (It was Sunday.) Lesson learned: if you need cash and you see an ATM that works in the town you’re in, don’t think you’ll find one later…you won’t! Grab the cash while you can! We stopped when we saw a local fellow selling coconuts and enjoyed his highly skilled demonstration of how to crack one open with a machete. A stop at Old Man Bay, another possible snorkeling spot listed in various books and websites, was disappointing: strong winds and currents and trash on the beach. We saw that elsewhere, too. One brochure even said that the trash “comes from cruise ships and that if you can get past it, you’ll find great snorkeling!” Uh…no, thanks. 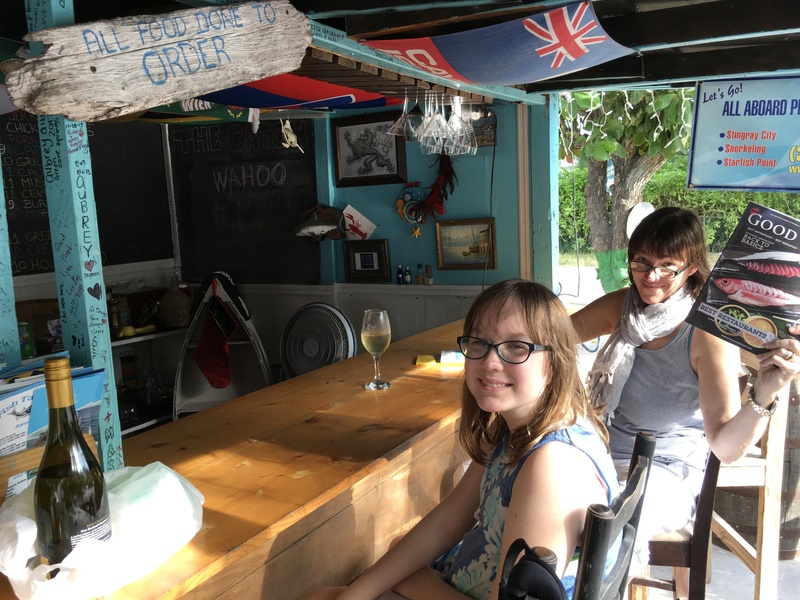 We made a stop for lunch at Kaibo Restaurant Beach Bar and Marina, just a turn away from Rum Point. 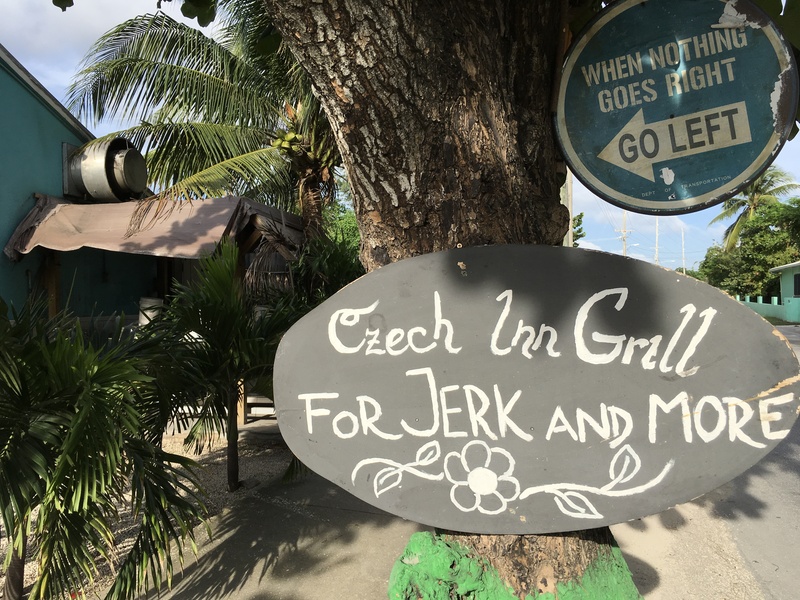 We enjoyed an excellent lunch–the jerk chicken was a standout–and contemplated returning there for dinner at their finer dining restaurant on the second floor. It, too, boasted one of the largest rum selections on the island. We never made it back to find out. After lunch, we headed to Rum Point, where we finally had our first attempt at snorkeling. 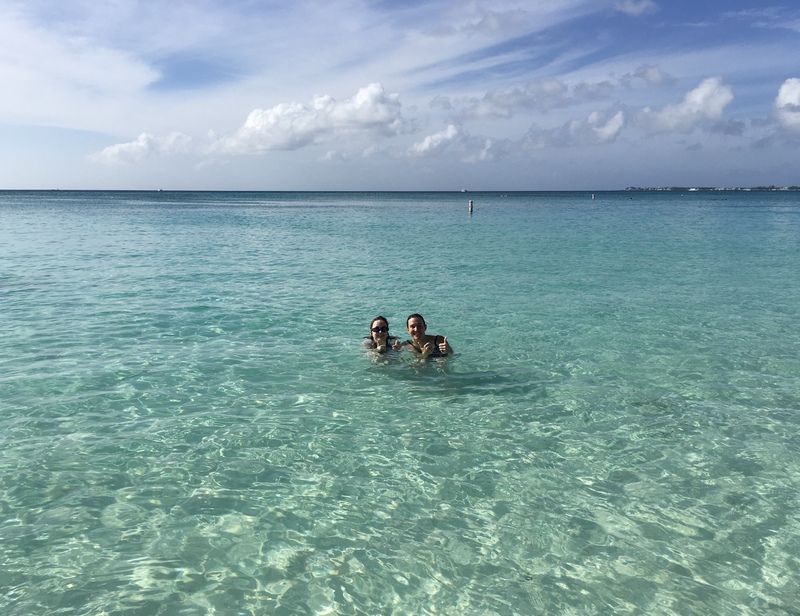 A small reef off the shore offered us a chance to see some tiny, colorful fish, and Rum Point itself offered beach chairs, sand, food, and bathrooms…everything we needed to spend the rest of day in the sun. One of the signs at Rum Point. 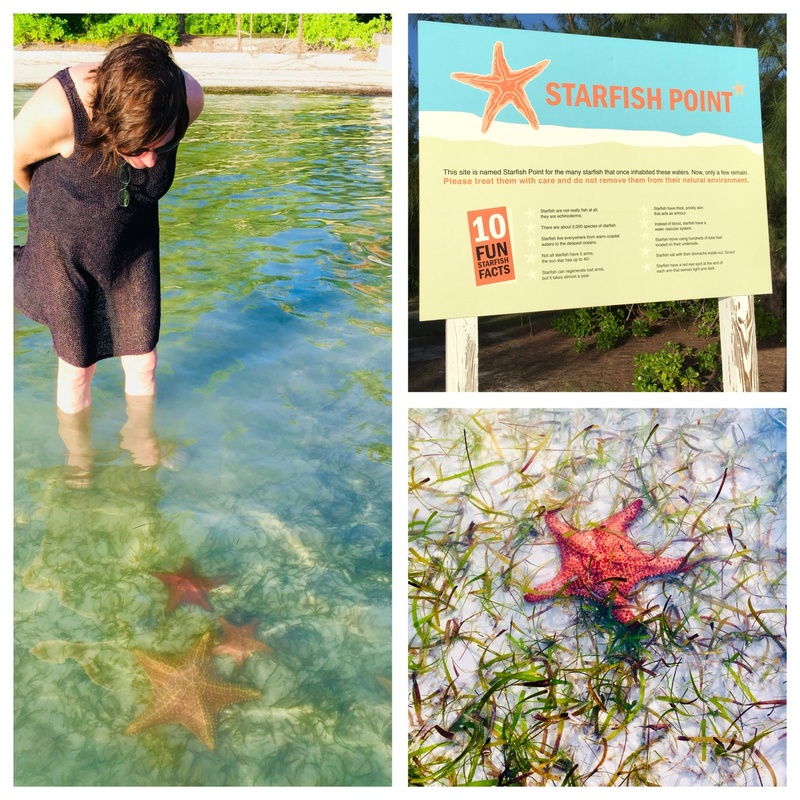 At the end of our day, we headed back toward Kaibo, because that’s where we found Starfish Point, a pretty patch of sand that attracts a large number of starfish. It was fascinating to see them. It’s OK to touch them, but never lift them out of the water. They need to stay underwater to stay alive. Rather than going to Kaibo for dinner, we chose to head back to Georgetown and dine at Guy Harvey’s Bar & Grill. The food was mediocre at best, as was the service. We should’ve known, because its location was right where the cruise ships drop off their passengers. As we would find out the more we ate on this island, it was pretty much the same food as everywhere else: Ceviche of the day? Wahoo. Special of the day? Snapper. Etc., etc. And with the Cayman dollar worth $1.25 US, even bad dining became an expensive part of the vacation, about $250 and up USA per dinner for 2 adults and 1 child. Our third day, we stopped in Georgetown for lunch, making a stop at The Rock Hard Cafe. (Just a stone’s throw from Guy Harvey’s.) 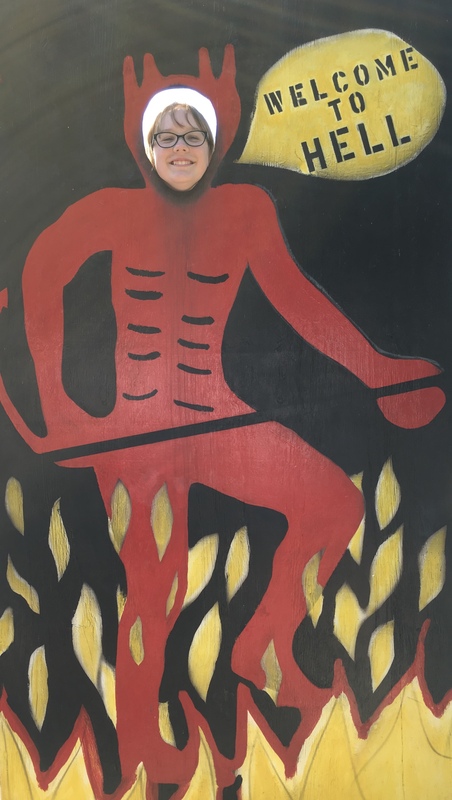 I have only myself to blame for being in this tourist trap: I got my daughter hooked on visiting Hard Rocks when I took her to the one at Universal Studios in Florida last year. After that, she wanted to visit every city with a Hard Rock! I promised her I’d take here to the one on Grand Cayman for lunch. We enjoyed good burgers and salads. We continued north after lunch and eventually arrived at the Westin Grand Cayman 7-Mile Beach Resort and Spa, where we would spend the next 5 nights. 7-Mile Beach is crowded, with one resort lined up after another. But they’re not stupid: they know their money comes from tourism, and despite the crowds, 7-Mile Beach remains pristine. Dinner that night gave us our first glimpse at the massive investment and construction that was moving at full speed in Grand Cayman. 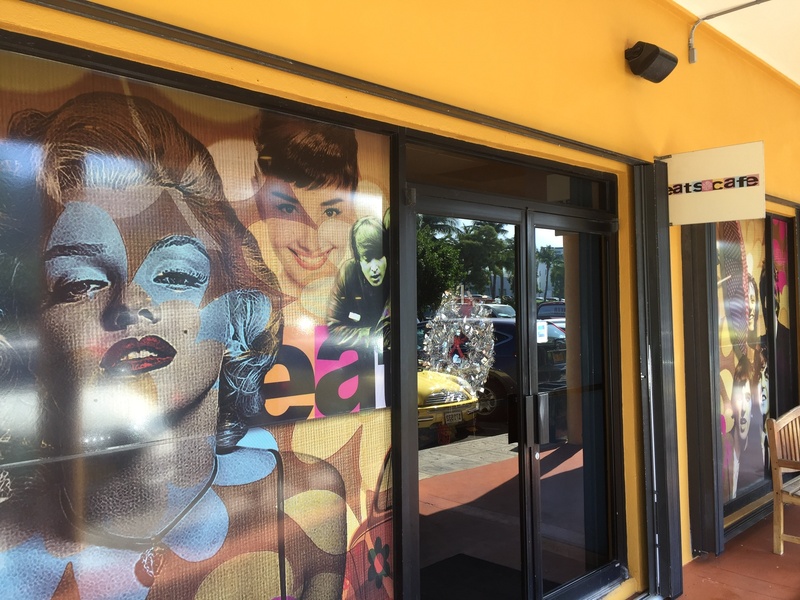 We dined at Mizu Asian Bistro + Bar, a sushi restaurant located at the sprawling (and sterile) Camana Bay shopping center. We (again) read good reviews about this restaurant and we (again) were disappointed. The sushi wasn’t bad, just not great. My daughter’s cooked dishes were better. And the price of half-decent sake was outrageous! I joked about how we should’ve brought sake from the States. Price gouging was apparently common at restaurants in the Camana Bay shopping center. I’m guessing they have huge rents to pay. Clever little gadget. 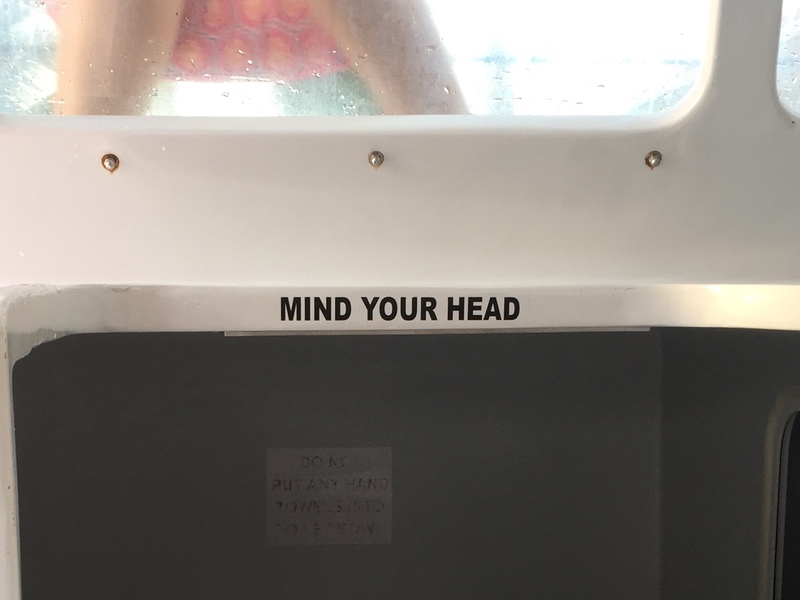 A button attached to each beach umbrella. Press it, and you get food and drink service without searching high and low for help! 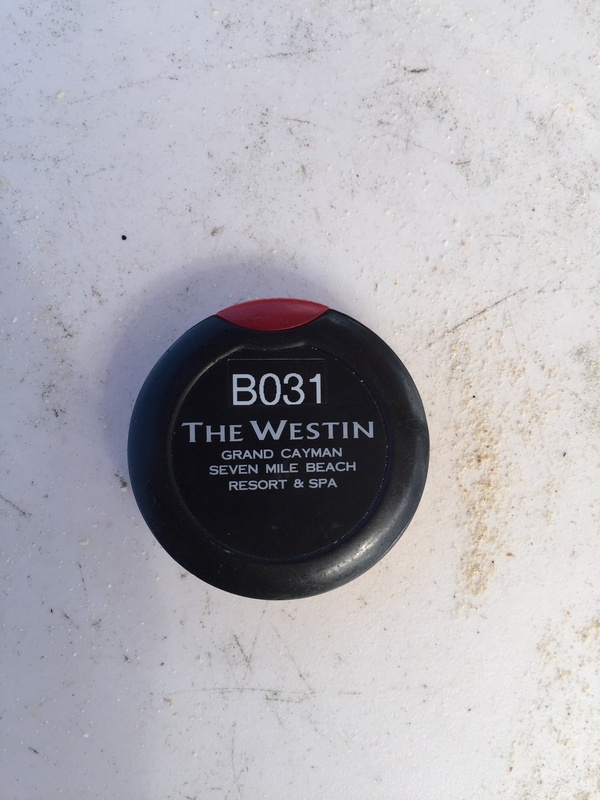 Once we settled into the Westin, we enjoyed several days of simply swimming, snorkeling and being lazy on the beach. 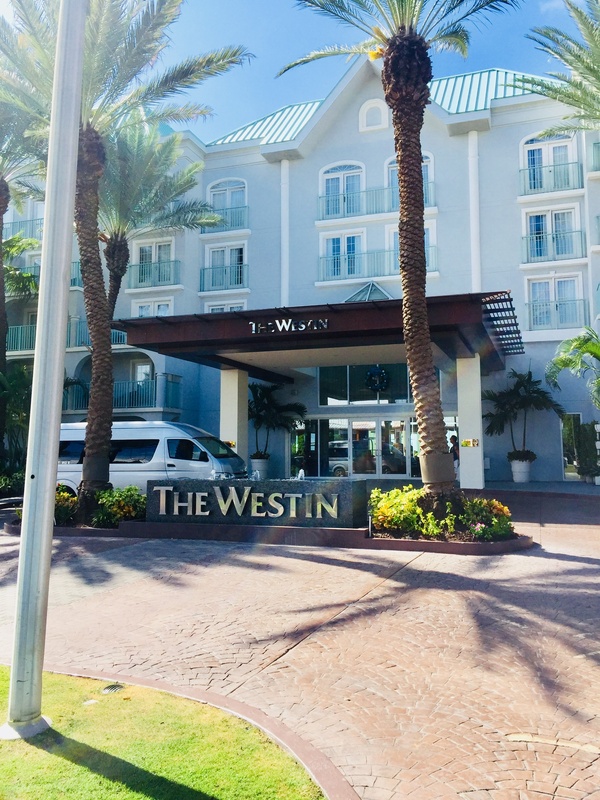 The Westin is one of the headquarters for Red Sail Sports, a company that rents any water sport equipment you can imagine. They also have a fleet of boats for snorkeling and diving trips. Everyone (and we) agree they’re the best on the island. My daughter rented a bicycle, literally a bike on a pontoon boat that you pedaled in the water! 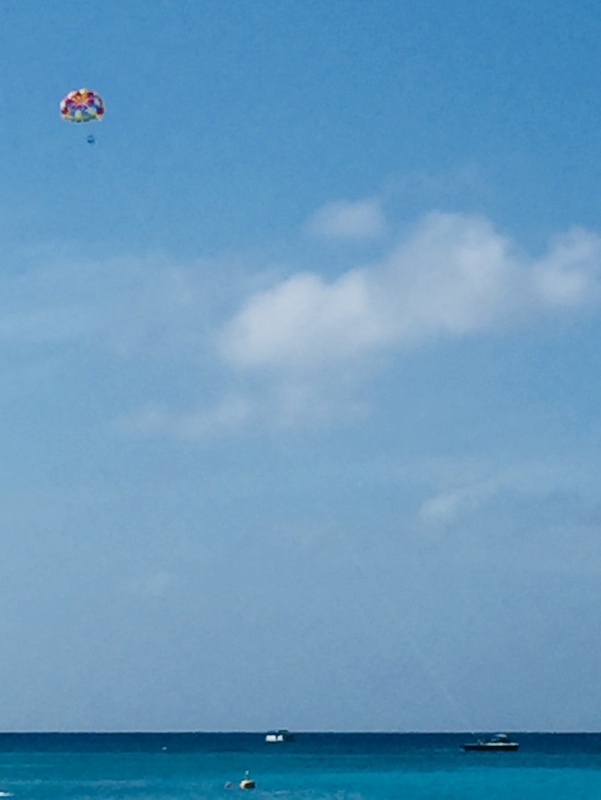 And she and my wife enjoyed a wild parasail ride as well. Balcony views at the Westin. 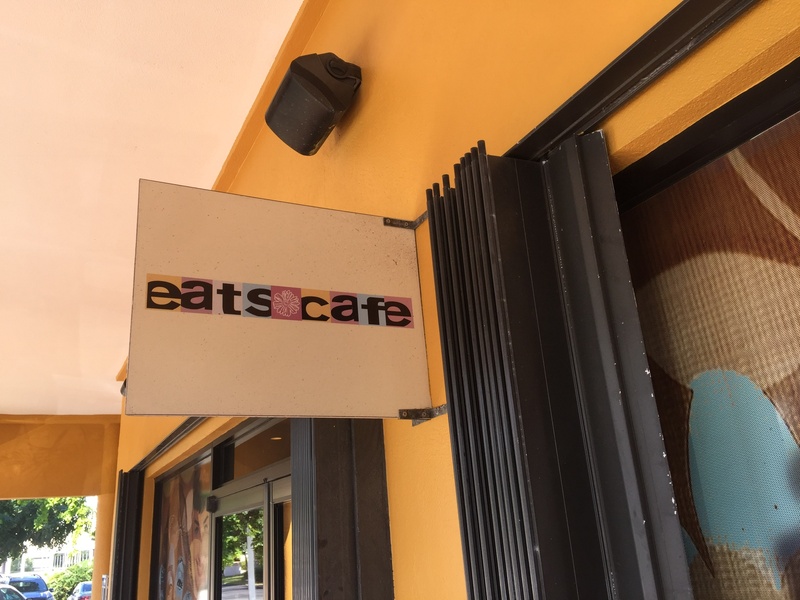 Good cheap eats across the street from the Westin at Eats Cafe. Scattered throughout our stay at the Westin, we took on a few trips. 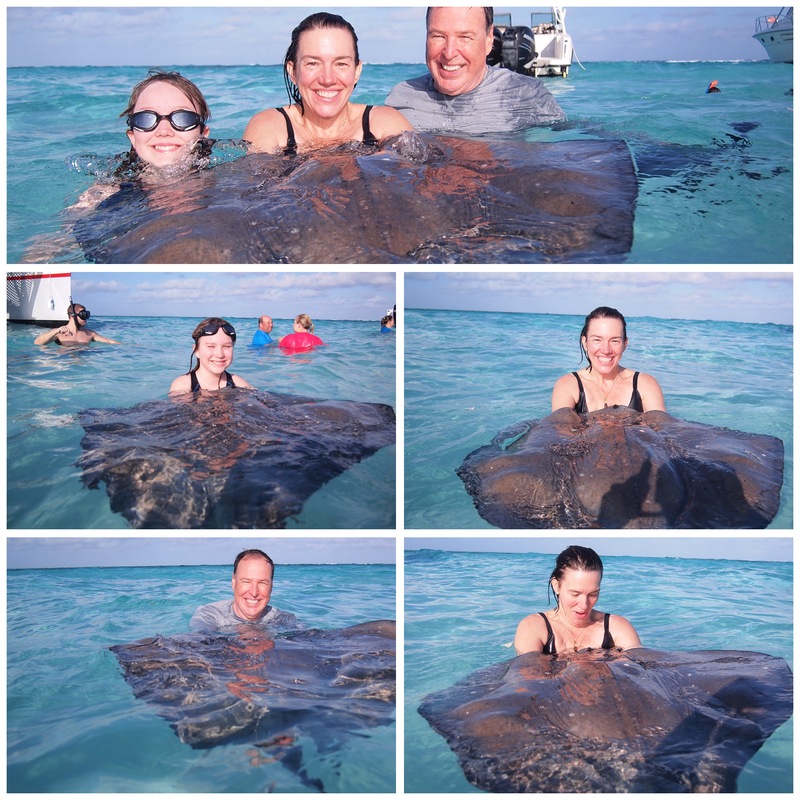 Probably the smartest way to see the stingrays at Stingray City, a must if you’re going to Grand Cayman, is to go first thing in the morning. 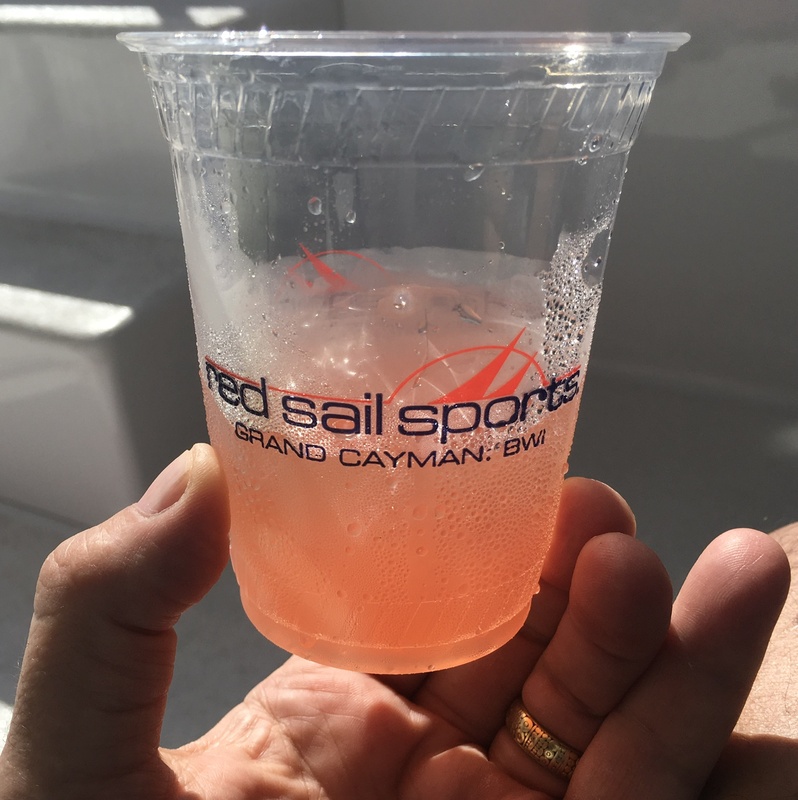 Red Sail Sports offers a “Breakfast with the Stingrays” trip that gets you out there before the real crowds arrive…and it can get really crowded with cruise ship passengers showing up by the boatload. 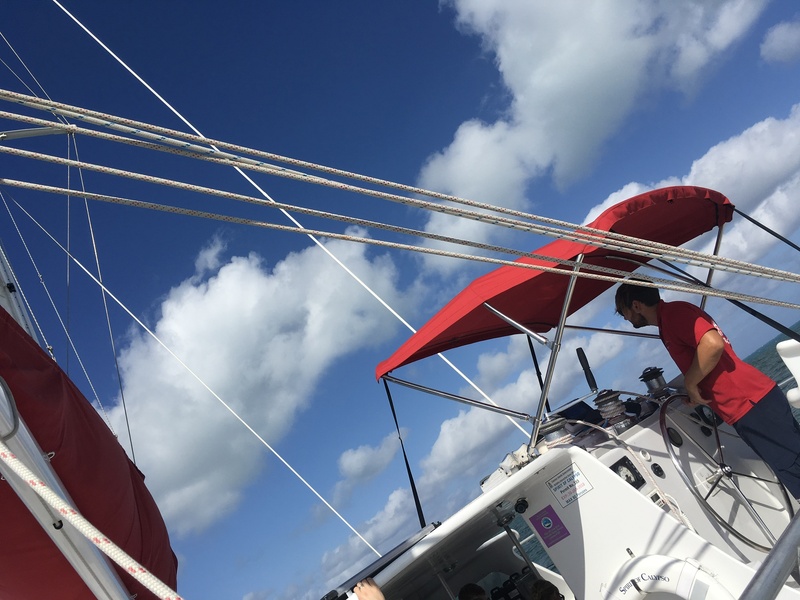 The staff on our beautiful 65′ catamaran was friendly and helpful, and they literally bring the rays to you, grabbing the attention of the stingrays they’ve handled many times before. The rays themselves are extremely gentle, and even though it wasn’t my first time swimming with them, it’s never anything less than amazing to bond with them. The females are the large ones, and we were fortunate enough to hang out with everyone’s favorite, Sandy, for some time. Another great trip was with George’s Watersports (www.stingraycitygrandcaymans.com). George is a young guy that runs his own company. He’s literally a one-man show, from the van driver that picks you up at your hotel, to the captain of the boat. But he’s energetic, upbeat, and a young businessman I was glad to support. Among the many trips George does every day, he offered a nighttime snorkel in the bioluminescent bay. A fast boat ride from the marina got us to the “Bio Bay,” as they called it. Nighttime settled in, the stars came out, and we jumped in the water with our snorkeling gear to swim among the billions of bioluminescent plankton that live in the bay. It was a wild experience to see your whole body sparkle as you swam through the water! My daughter was particularly thrilled, waving her hands through the water, her fingertips sparkling like some character from a Harry Potter movie. Sadly, photos just don’t pick up the bioluminescence. You need to put on a snorkel mask and dive in. It’s worth it! On our way back, we made a stop at Cemetery Beach. 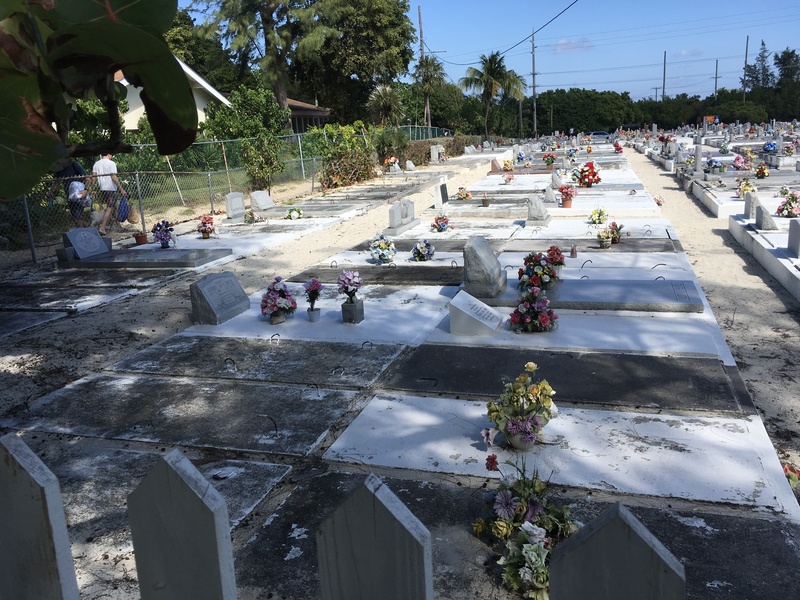 Park your car along the street, then walk the marked path on the side of the cemetery to the beach. The water is beautiful, and the snorkeling was the best we had on our entire trip. It’s pretty common to find beaches located behind the cemeteries, even fast food restaurants. For example, there’s one beach, appropriately called “Cheeseburger Beach,” because it’s located behind a Burger King. The cemetery at Cemetery Beach. 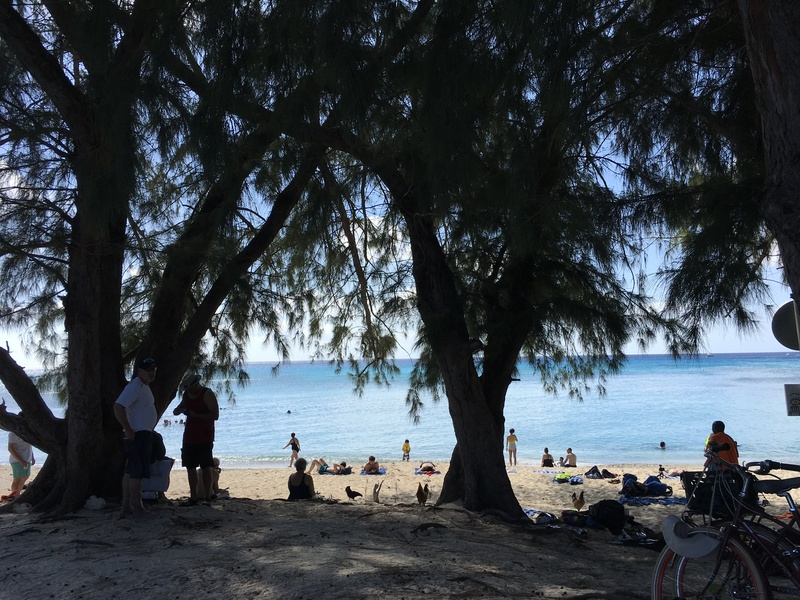 …And the beach at Cemetery Beach. 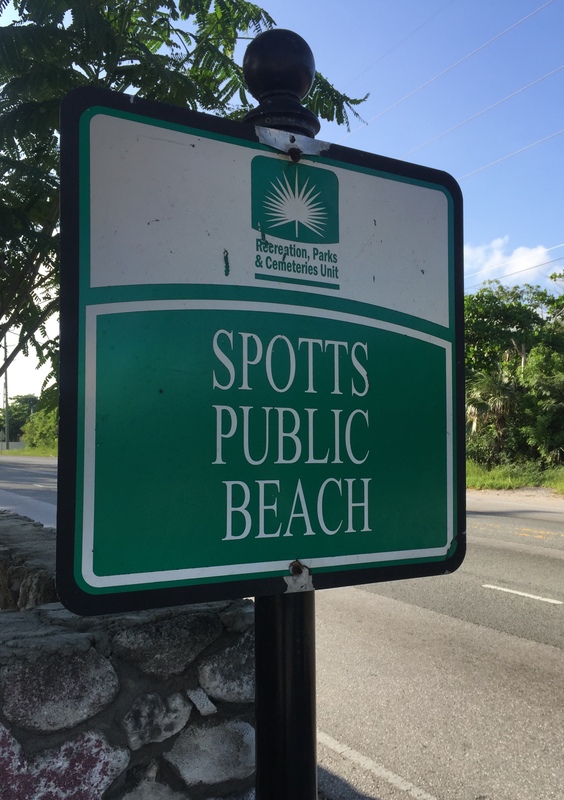 Heading back south toward Georgetown, and then further east toward Boddentown, other snorkeling adventures included stops at two public beaches: Smith Barcadere (or Smith’s Beach) and Spotts Beach, a favorite of locals and a hangout for sea turtles. The waters were a bit rough…we didn’t see much of anything. But it was a fun adventure nonetheless. Both beaches are clearly marked, with parking nearby. Great food is an important part of any trip we take. It doesn’t have to be fine dining…a shack on the water is totally fine, as long as the food is fantastic. 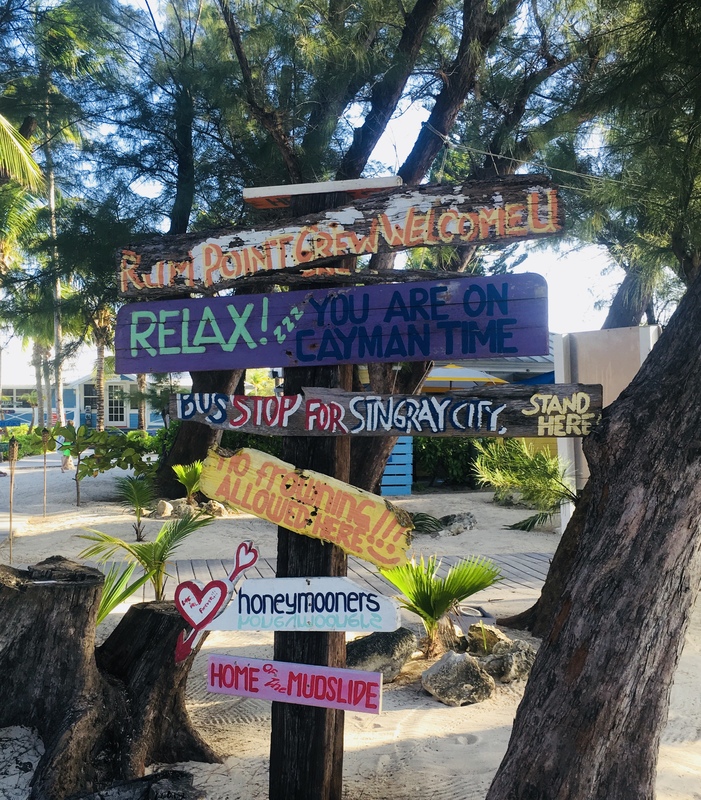 Most of Grand Cayman lacks that old island charm, with the exception of the few places I mentioned earlier on the East End. 7-Mile Beach is where the luxury resorts are located, and that means fine dining, or at least the Cayman version of it. As I mentioned, because everything is imported to the island, the menus at most of these restaurants is pretty much the same. What varies is the dining room and the view. So despite the fact that the Cayman Islands tourism board brags about being “The Culinary Capital of the Caribbean,” there are really very few excellent restaurants. They are, for the most part, nice hotel restaurants. (And that’s not a complement.) 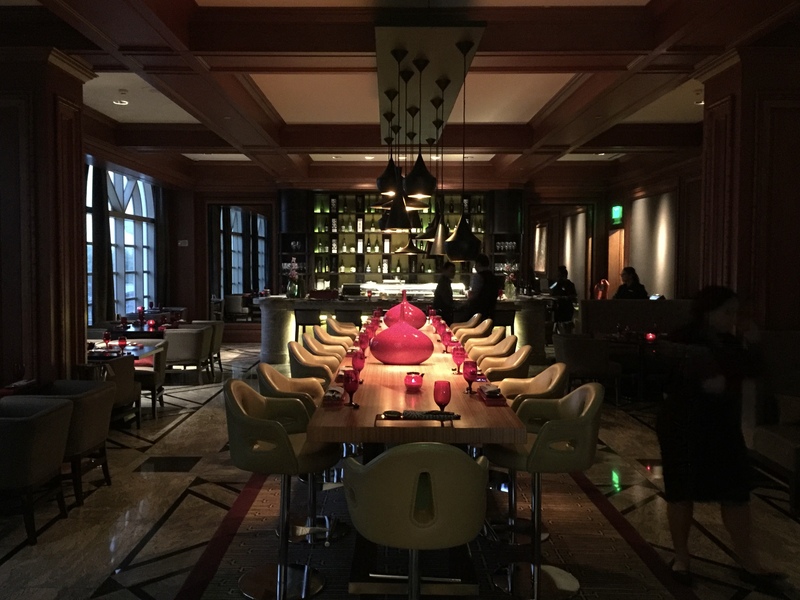 It probably should come as no surprise, then, that the 2 best restaurants we found are at the fanciest hotel: the Ritz Carlton. Blue by Eric Ripert. 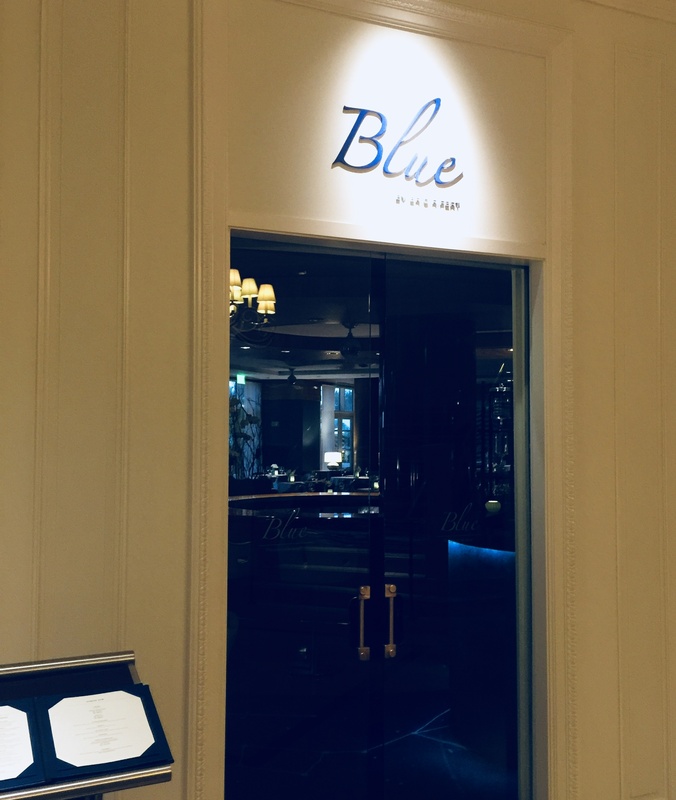 A newcomer to the island, Blue has made a big splash, totally reinventing the idea of fine dining. Eric Ripert is the Michelin star award-winning chef of NYC’s Le Bernardin, widely considered one of the top restaurants in the world. 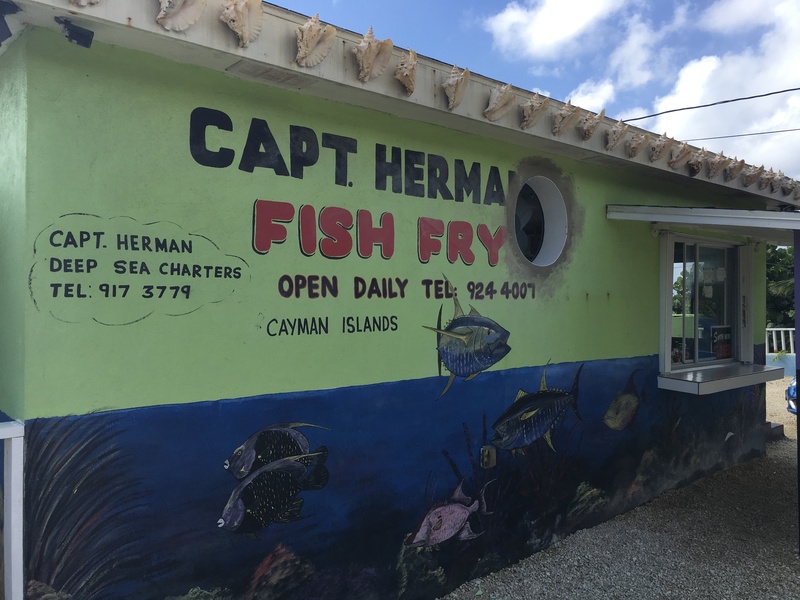 For him to put his name on another restaurant had to mean drastic changes in the way they do business in the Cayman Islands. For one thing, the same importer that brings all the same mediocre products to the other restaurants, was not going to cut it. 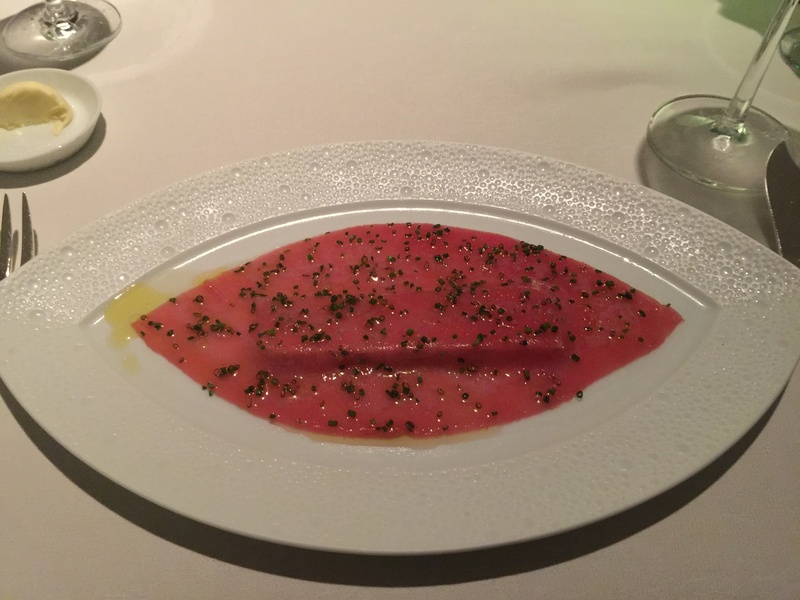 Ripert uses exotic, expensive, hard-to-get ingredients in his recipes that certainly required a new source, someone who could consistently bring him the highest quality tuna, foie gras, and other luxury ingredients. The staff at Blue is well-trained: the service is beyond reproach, yet they don’t hover over you while you try to eat. And the kitchen staff was hand-picked by Ripert himself, who visits regularly. What it all amounts to is the finest dining experience on the island: impeccably fresh seafood with the lightest touch of the finest ingredients to make the dishes really shine. One example was the tuna with foie gras, a combination that couldn’t possibly work on paper, but turned out to be a mindblower. Tuna with foie gras. Tuna pounded thin, with a foe gras “wafer” underneath. Of course, you pay a hefty price for all this luxury, and as expensive as dining is on this island, Blue kicks the price tag up a notch. All I can say is, go cheap somewhere else and treat yourself to Blue. Taikun at the Ritz Carlton. 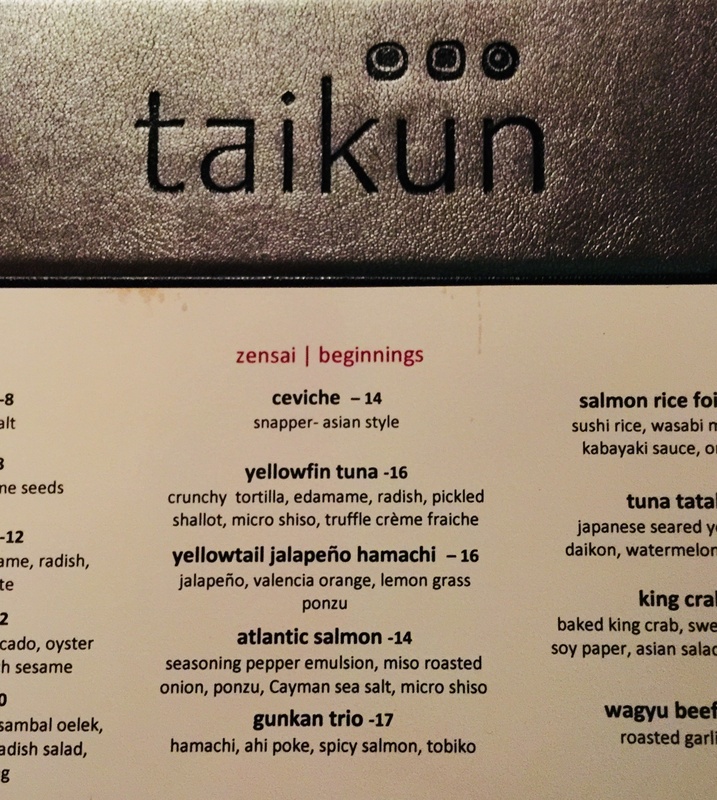 The fact that Taikun is the best sushi restaurant on the island is no doubt in part possible by the influence of the new and exotic ingredients imported for Blue by Eric Ripert. Hey, if one restaurant at the Ritz is getting them, why not two? They even had their own version of tuna with foie gras on their menu. Beautiful sushi, and an excellent, though expensive sake list. The dining room at Taikun. 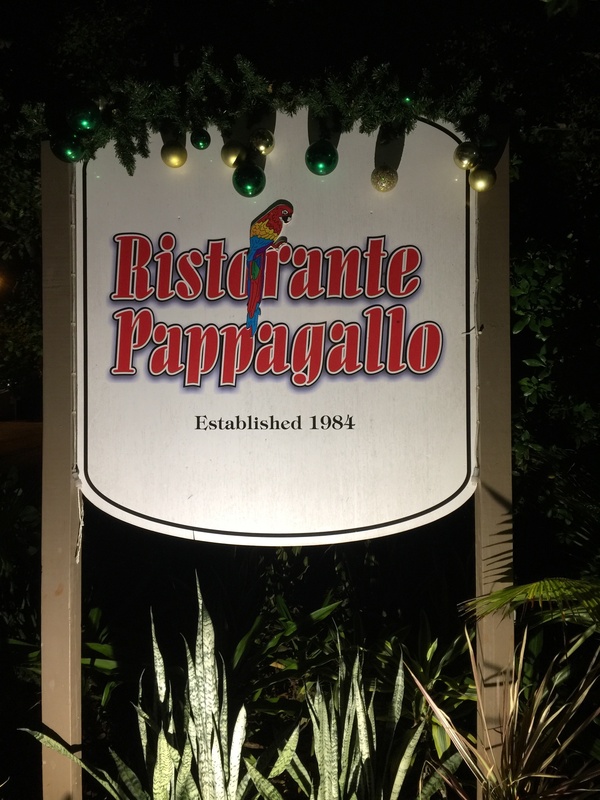 Ristorante Pappagallo: Our third favorite restaurant caught us by surprise. We thought for sure that it would be touristy, yet they served some of the most delicious and authentic Italian food we’ve had in a long time: handmade gnocchi, fabulous beef carpaccio, eye-rollingly good risotto…and an excellent wine list. 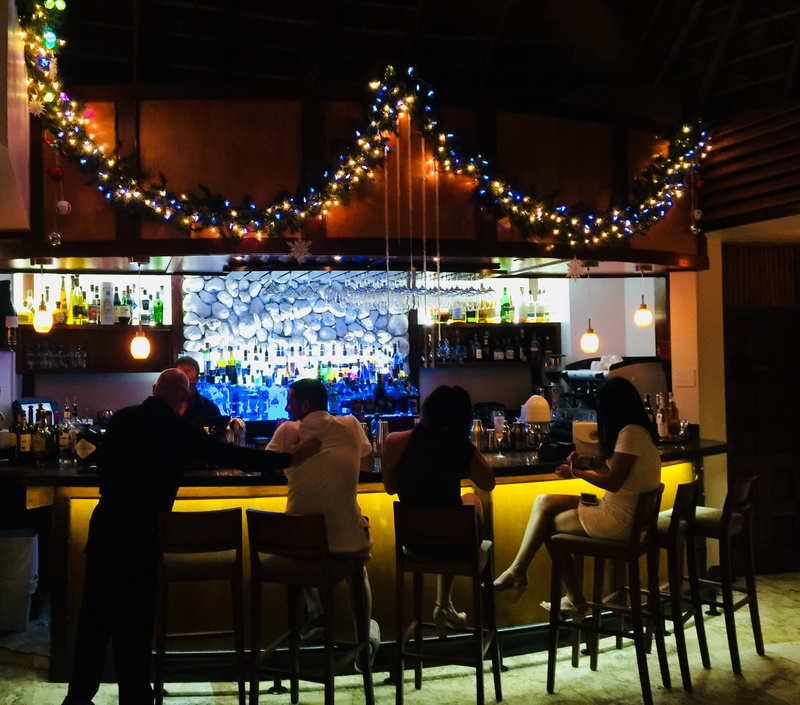 Also, one of the best bars and bartenders on the island…real mixology. The bar at Ristorante Pappagallo. 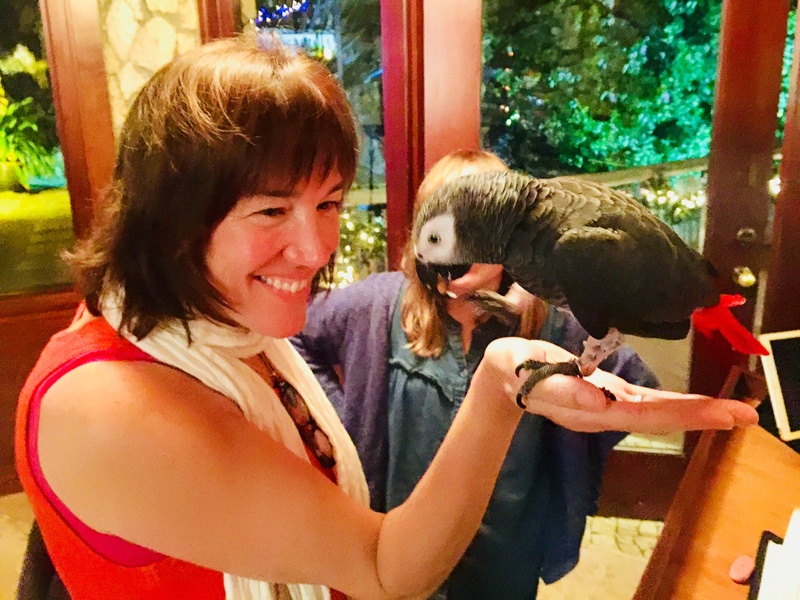 Plus, a wonderful old parrot that’s been there for 35 years! 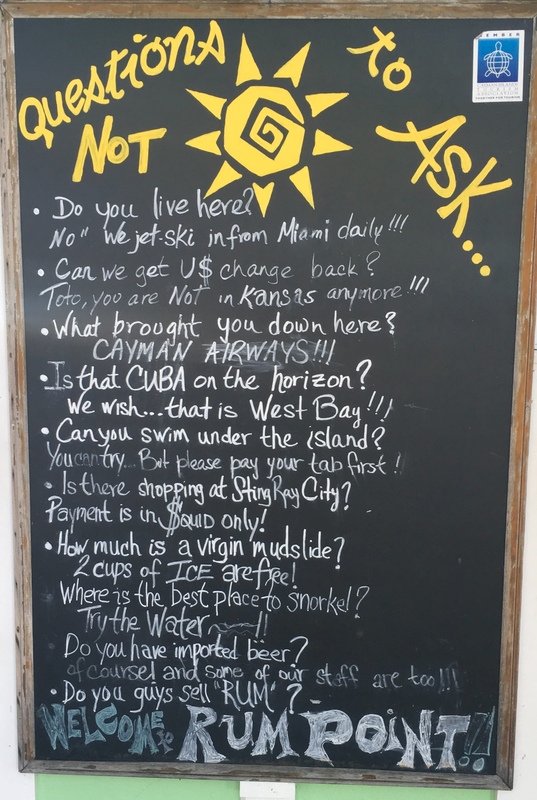 The worst part about our trip to the Cayman Islands was the airport. For all that money invested in this island, you’d think they would have a state-of-the-art facility. Quite the opposite. It’s crowded, disorganized, low-tech, and dirty…enough of a negative that it makes you think twice about coming back…which is too bad, because it’s the last memory you have of your vacation. 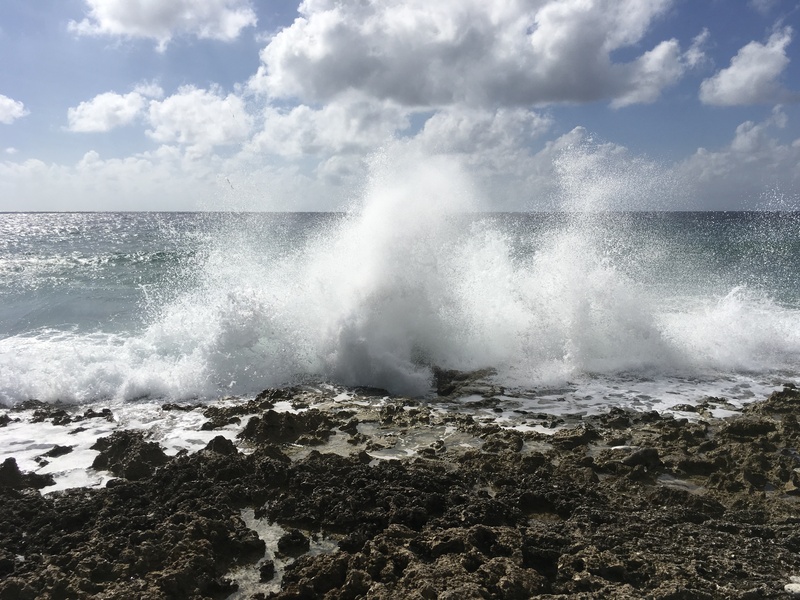 With so many other island choices in the Caribbean, it’s hard to say whether we’ll be back to Grand Cayman any time soon. But we needed the rest and relaxation…and despite a few snags, we got that!